By the last day of post planning, emotional and physical exhaustion consumed me. Fifteen extra pounds crept onto me during the school year, and I could feel every one of them dragging behind (and all around) me. I could barely speak to colleagues and just wanted to run out the door. That was a month ago, and I have been practicing some serious self-care since then. I have lost 9 pounds so far; I'm exercising every day, eating healthy meals, and meditating and relaxing. I am becoming a whole person again. The added bonus: I am planning some very creative, challenging lessons for this next year and have the energy to write this post. 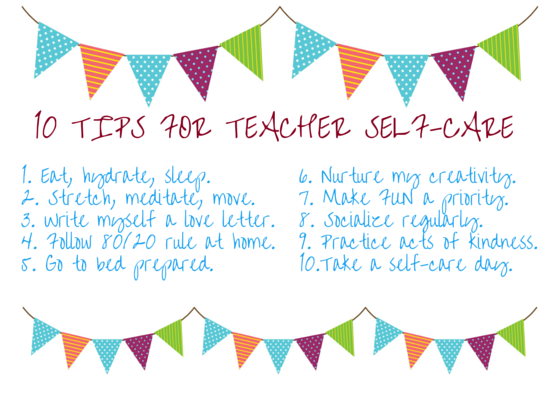 To prevent reaching such a low point again, I devised a list of self-care strategies to help me maintain my health and energy throughout the next school year. Maybe they will help someone else. To eat well this year, I will bring my lunch and snacks to control the types of foods and the portions I eat. I refuse to run to the cafeteria, buy the corn dog and crinkle fries combo (which I love) or head to the vending machines to feed the 2:00 hunger attack. I will drink adequate water. My personal trainer was appalled at the amount of water I was NOT drinking. She required me to drink 72 ounces a day, and I saw a difference. My daily afternoon headaches abated, and the dry patches of skin disappeared. I know my body needs at least 7 hours of sleep to function at my optimal level. Because my school day begins at 6:30, and I commute 45 minutes, I must be in bed by 9:00. That means I miss some favorite shows like Modern Family and Parks and Recreation, but staying up just one hour later causes some serious lag the next day. Yoga is a miracle worker because it not only stretches muscles but it stretches veins and arteries, too. Just five minutes of yoga in the morning alleviates my neck and shoulder pain and helps me maintain calmness. I use this bunny poster as a guide http://www.bunnyoga.com/asanas.html. It makes me smile. I will meditate while I practice my yoga poses. I will think positive affirmations, I will visualize a productive school day, and I will pray for family, friends, and students. I will move my body every day even if it's just 20 minutes a day. For me, that means long walks outside because I have discovered in the last three months (before I read this article) that walking in nature is the key my mental health. I'm happier and more creative when I walk regularly OUTSIDE. Write a love letter . . . to myself. Criticizing my work and myself is my standard MO. One principal told me I could only see the "cogs" in the gears of school. True, so I will work hard at seeing the positives and write a love letter to myself monthly. The idea came from this video from Soul Pancake https://www.youtube.com/watch?v=ojUrs28LeGM. Follow 80/20 rule at home. Because I can lose myself in planning for hours on Saturday and Sunday, I will practice the 80/20 rule and only work on school stuff 20% of the weekend, if at all. The remaining 80% will belong to family and friends, or just to me. I will pack the lunch, lay out the clothes, and gather the materials to grab at the door on the way out. So simple, but it does make for a calmer start to the day. Regarding clothes, I will dress deliberately. For me this is really important. It may seem superficial, but the more professionally I am dressed, the more professionally I act. Toward the end of this last year, I was just throwing on yoga pants for work. Now don't judge me. They were very loose, well-made, expensive yoga pants, but they were still yoga pants, a big no-no according to http://teaching.monster.com/careers/articles/8431-what-teachers-should-never-ever-wear?page=7 (Note to self: the loose-fitting yoga pants played a role in the weight gain because I couldn't feel my waist expanding. Don't do that again.) So, this year, I am pinning some professional clothing options to my Pinterest Style Sense board and putting together some coordinated outfits. Dressing with detail will influence working with detail. I will explore Pinterest boards or read blogs. Once the school year starts, the danger of becoming stagnant with lessons grows. Each week, I will look for one interesting activity or classroom management strategy to try the following week. I will also watch at least one inspiring teacher movie a month. Seems corny, but these movies will help me remember why I chose to spend my days with moody, irrational, spontaneous, wonderful teenagers. I will find time for fun this year. It may be a quick little game or art project (I teach high school). It might be a surprise ice cream snack, but I will do something that will build relationships in the classroom and give students something to anticipate. Meeting with teacher friends helps me realize I am not the only teacher struggling with certain students in the classroom, and I love the ideas my colleagues give me. We will have to follow the 80/20 rule and only allow criticism and complaints to last 20% of the time because venting does help relieve stress and gain perspective, but then during the remaining 80%, brainstorm creative solutions or share some best practices. I will continue to attend after-school events. I started a couple of years ago attending as many of my students' extra-curricular activities as possible such as baseball games, soccer matches, band concerts, drama performances, piano recitals, beauty pageants, and awards programs. Two major benefits from doing this: 1) students appreciate the effort of showing up for them and it helps build strong classroom relationships, and 2) I meet parents and see their relationships with their children which opens my mind and heart more toward my students because I see them and their parents as "real" people. At the end of many schools days, I realized that I had spoken individually to just a few students and colleagues. This year, I'm going to choose one student and one colleague each day to show kindness (discreetly, of course) by a compliment, a small gift, a kind word, etc. 10. Take a self-care day, if needed. If I become too exhausted or feel anxious for an extended period, then I will take a mental-health day and practice self-care all day. Doing this in the past made me a better mother, and it will make me a better teacher. Sometimes, I just need a break from the daily grind. Yes, I know we have summers off, but working with children 8-9 hours a day is tough. They have so many different personalities and needs, and they can drain a teacher's energy. Not only am I responsible for their academic success but their physical safety as well. Only teachers understand this kind of stress. My new mantra is now "Great Year 2014", and by practicing these self-care tips, it will be. I created this checklist to use daily.